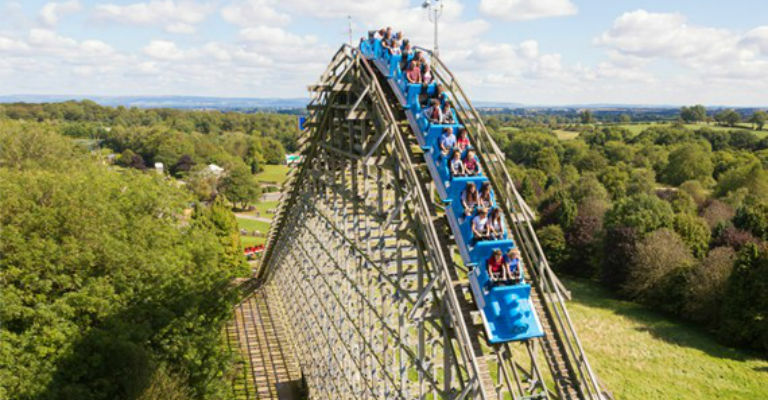 Fairground rides operate from 10:00am with all major rides and attractions operating from 10:30am. There is also fantastic family fun rides and attractions; including the Lightwater Express train ride around the park, Eagle’s Creek Farm tractor ride, a selection of fairground and water rides, plus the Adventure Playground and Mini Sand Diggers. Plus don’t forget to visit the indoor Soft Play & Cafe perfect for under 8s to run off some energy while the grownups can take a seat and enjoy a relaxing drink and snack. Enjoy the wet ‘n’ wild fun on the Wild River Rapids, and swashbuckling adventures aboard speedy Skull Rock and the tummy-tickling Flying Cutlass. Plus jump around on the huge Jumpin’ Jacks bouncy pillow. If you are looking for the ultimate adventure then take to the skies in the grip of the Eagle’s Claw, venture into the underground world of Raptor Attack, see the park from a whole different viewpoint aboard Black Pearl and then hop on Apollo and take a spinning ride above the tree tops. Fireworks Spectacular choreographer to music set over the picturesque Swan Lake. Tree Top Nets – High in the trees giant trampolines, walkways, slides and tunnels made out of netting, suspended 9 metres off the ground. Jurassic Adventure Golf – An 18 hole dinosaur-themed golf course.